Home » How has your organization embraced Indigenous inclusion? How has your organization embraced Indigenous inclusion? Are you conscious of the current Indigenous workforce landscape? What steps can you take to integrate Indigenous talent into your labor pool? Once you start hiring Indigenous employees, are you creating an inclusive environment and fostering the proper corporate culture? There are many questions that organizations across Canada need to ask in order to create or evolve their Indigenous workforce strategy. Understanding the unique value and skills of the Indigenous Peoples as well as the ability to communicate, partner, recruit, and retain these employees has a significant impact on your business. 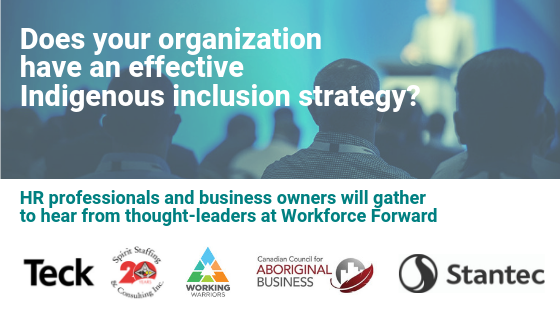 Workforce Forward, taking place on day three of Forward Summit, is a one-day conference program that addresses how to effectively pursue and engage with Indigenous talent. HR professionals and business leaders gather to get perspectives from organizations who implement large scale employment partnerships with Indigenous communities. Attendees at Workforce Forward participate in workshops, panels and roundtables led by organizations who are committed to breaking down barriers and building capacity. Hear from organizations like Teck Resources, Suncor, Stantec, Canadian Council for Aboriginal Business, Working Warriors, Spirit Staffing and other thought-leaders who will explore business cases and unique approaches within the evolving workforce landscape. Registered attendees at Workforce Forward enjoy a full-day of insightful sessions and networking opportunities in a professional environment. Connect with thought-leaders in major sectors that continue to raise the bar and push industry towards economic reconciliation. Forward Summit will return in 2020 to continue the important conversations related to Indigenous economies and workforce. Sign up for the Forward Summit newsletter to receive the latest information on show dates, topics, and speakers. The @forward_summit team is grateful to have special relationship with the Convention Centre to have a safe space to support such an important dialogue. If you haven't read the @CTCC_Calgary Blog about our inaugural event, please check it out! We are extremely humbled and honored to have hosted Forward Summit. Thank you for your belief and participation. Below, a simple signing ceremony with the first podium sign from Connect Partnership Group.